The Supreme Court’s 5-4 decision in Janus v. AFSCME, Council 31, abandons decades of commonsense precedent. In this case, a bare majority of the court, over the vigorous dissent of four justices, has conceded to the dark web of corporations and wealthy donors who wish to take away the freedoms of working people. Until it is overturned, this decision will be a political stain on what is intended to be the most honorable, independent body in the world. But more importantly, it will further empower the corporate elites in their efforts to thwart the aspirations of millions of working people standing together for a better life. But here’s the thing: America is heading in a different direction. All over the country, workers are organizing and taking collective action as we haven’t seen in years. More than 14,000 workers recently formed or joined unions in just a single week. This followed a year where 262,000 workers organized and the approval rating of unions reached a nearly 14-year high. 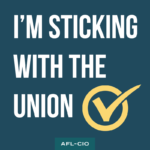 Working families know the best way to get a raise, better benefits and a voice on the job is through a union contract. The corporate narrative of the labor movement’s downfall is being dismantled by working people every single day. We have never depended on any politician or judge to decide our fate and we aren’t about to start now. For more information, visit FreedomtoJoin.org. Copyright © 2017 Sena9158 All rights reserved.